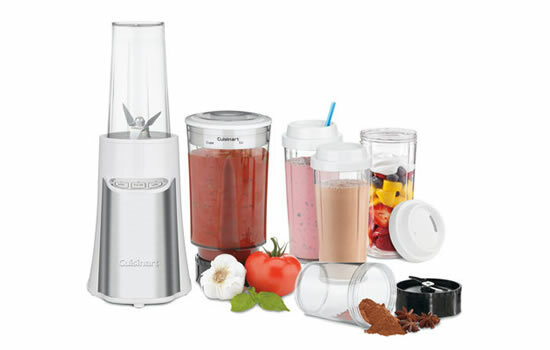 Cuisinart manufactures a series of powerful and versatile blender models that can make a practical choice when creating smoothies. The ReMix7.5 is a pre-programmed and powerful blender model that is perfect for smoothies and crushing ice. It is programmed with low and high speeds as well as a reliable pulse action. Its 56 Oz plastic container means it is able to blend a lot of ingredients at once, which makes it a perfect model to use with families. For an attractive look on the countertop, the blender is given a professional look with a sleek and stylish brushed silver design. The touchpad controls simplify the process of choosing the right controls to operate the machine. This blender stands at 7.75 inches x 10 inches x 13.6 inches and weighs about 10 lbs. The SmartPower compact and portable blender is slim and compact but offers high-powered performance to ensure the smoothie ingredients are blended in a flash. This blender comes with travel cups so a perfect choice for those looking for the more on-the-go appliance. The main blending jar is 32 Oz while the travel cups still offer a generous 16 oz. Its 350 watt motor is able to deliver big performance and the user-friendly one-hand control makes it very easy to use and operate. Plus, the SmartPower blender is designed with stainless steel accents to make a quite stylish and attractive addition to sit on the kitchen countertop. The PowerEdge is a high-performance model that is great for making delicious gourmet sauces and soups to drinks and smoothies. It is built with the latest Power6 Turbo-Edge blade which is able to make light work of blending down raw fruit and vegetables to crushing ice cubes. The built-in timer makes it easy to control and operate. Plus, the 56 Oz blender container is perfect for offering easy cleanup and washing. This unit comes with an attractive design and look with a die-cast metal housing with black accent pieces. With a powerful 700 watt motor, the PowerEdge is certain to perform well when it comes to producing all types of drinks and soups. The Cuisinart blender model has the capacity and power to take on responsibility for a variety of blending jobs. The PowerBlend 600 is built with a powerful 600-watt motor and 7 speeds to simplify nearly most needs and can make the fruit or vegetable smoothies in no time. A variety of buttons and controls are featured, including crush ice, liquefy, chop, puree, mix, stir, and pulse action. Plus, for ease in clean up the jar and lid will easily detach and these can be cleaned in the dishwasher. A push-in storage cord also makes this blender convenient to pack away when not in use. This blender stands at 8.45 inches x 6.75 inches x 15.5 inches to offer a solid platform for the wide-ranging blending needs.